State of the art predictive design. Direct 3D Digital output to casting. 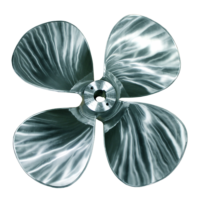 Although the design and manufacturing process of today’s marine propeller has changed considerably, Kahlenberg has been designing and manufacturing marine propellers and marine propulsion systems continuously for over 100 years. 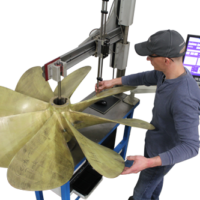 Specializing in propellers for commercial service, Kahlenberg currently offers a wide variety of fixed pitch designs made from stainless steel, nickel aluminum bronze (Nibral), and manganese bronze. Kahlenberg repairs propellers of bronze, NIBRAL (Nickel Aluminum Bronze), and stainless steel from 14 inches to over 120 inches in diameter. Propellers are digitally scanned and records are created including complete geometric propeller data for “before” and “after” repair conditions. 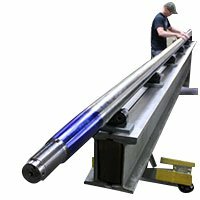 Current capabilities allow for machining of shafts up to 24′ long and 6″” diameter including SAE tapered propeller ends. Materials available include specific stainless steel marine grade shaft alloys numbered 17, 19, 22, and 22HS, chosen not only for their strength and corrosion resistance but also for the production straightness tolerances of these materials vs. typical mill straightness tolerances of non-marine stainless bars. Established in 1895, Kahlenberg Industries, Inc. has been continuously family owned and managed since its founding over a century ago.